POMPANO BEACH, Fla. - State records show rodent droppings were found last week inside a box of grits, inside a box of ranch dressing and inside a box of marshmallows at the Golden Corral in Pompano Beach. An inspector with the Florida Department of Business and Professional Regulation was there based on a complaint. In fact, inspectors have been to that Golden Corral location eight times this year, all based on complaints. The popular Ms. Cheezious food truck was also ordered to stop serving food after a roach issue was found. Ms. Cheezious was also operating with an expired state license. Rodent issues were also found at Schwartz's Deli and Grill in Coconut Creek, Wanfu Chinese Restaurant in Pompano Beach and Sunset Bakery in Sunrise. All the places mentioned were allowed to re-open following an ordered cleanup and then a re-inspection. "Stop Sale issued due to food not being in a wholesome, sound condition. Observed rodent dropping inside box of grits, inside box of ranch dressing, inside box of marshmallows, on top off can of tomatoes and on top of boxes of pancakes." "Rodent activity present as evidenced by rodent droppings found. Observed approximately 80 dry rodent dropping on top of dish machine, 3 dry under dry storage shelve in bakery, 20 dry under salad bar station on shelves and chiller unit. Approximately 8 dry on ladder stored near back door, 1 dry on can of tomatoes, 3 dry on box of pancake mix, 5 fresh in box of marshmallows. Observed approximately 6 dry in box of grits, 10 dry in box of ranch dressing , 30 dry under dry storage shelves and 10 dry under soda box storage." "Raw animal foods not properly separated from one another based upon minimum required cooking temperature in walk-in cooler. Raw beef over raw pork in walk in meat cooler." "Potentially hazardous (time/temperature control for safety) food identified in the written procedure as a food held using time as a public health control has no time marking and the time removed from temperature control cannot be determined. All TCS items at salad bar station including ham, egg salad, pasta salads, cheese and cut greens. Meatloaf at hot station not marked. Employee used label machine to mark all times." 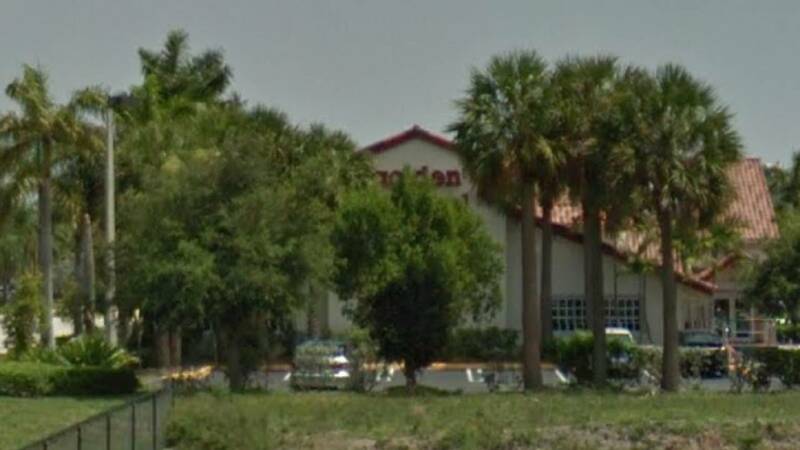 "We take pride in the high standards set by the Golden Corral brand and we’re disappointed that our Pompano Beach restaurant located at 2100 West Atlantic Boulevard was unable to meet those standards, a situation we have worked diligently to correct. We closed temporarily to address operational issues and thoroughly clean the premises. We are also implementing operational training to ensure all employees are current on our existing processes and procedures. Following a health department re-inspection on 10/12/17, we were approved to re-open the restaurant and look forward to treating guests to the top-quality experience they deserve." "Rodent activity present as evidenced by rodent droppings found. Observed 1 fresh rodent dropping under dishwashing table, approximately 10 fresh droppings under food preparation sink, 1 fresh dropping at employees restroom door, 5 dry droppings under Hobart mixer and 1 fresh dropping found at dry storage area." "Dead roaches on premises. Observed 2 dead roaches under 3 compartment sink in kitchen." "Stop Sale issued on potentially hazardous (time/temperature control for safety) food due to temperature abuse. All potentially hazardous (time/temperature control for safety) foods in reach-in cooler cold held at greater than 41 degrees Fahrenheit. All TCS foods in M3 flip top cooler found at 47°-53°F , as per operator, all items were in unit for more than 6 hours. See stop sale." "Accumulation of black/green mold-like substance in the interior of the ice machine. Observed interior of ice machine needs cleaning **Repeat Violation**." "Live, small flying insects in kitchen, food preparation area, or food storage area. Observed 2 flies in kitchen." "Bathroom facility not clean. Urinal in male restroom." "Interior of microwave soiled with encrusted food debris. Observed 1 microwave in kitchen needs cleaning and 1 microwave in front counter needs cleaning." "Encrusted material on can opener blade." "Roach activity present as evidenced by live roaches found. Observed live roaches approximately: 7 under flat grill 3 on floor under prep table 2 inside cabinet that has a bag with single service items 1 inside cabinet with chemicals inside." "Hotel and Restaurant license decal not displayed on mobile food dispensing vehicle. Expired." "Establishment operating without a license from the Division of Hotels and Restaurants." "Roach activity present as evidenced by live roaches found. Observed approximately 10 live roaches behind frames on the wall in a hallway next to the kitchen, 8 live roaches inside the kitchen where the silverware is stored, 3 live roaches around the kitchen hand wash sink and 2 live roaches crawling on a food storage container by the cook line and 1 live roach inside the reach in cooler located in the kitchen." "Dead roaches on premises. Observed approximately 24 dead roaches around 3 compartment sink in the dishwashing area. Also hundreds of dead roaches inside the kitchen area (under and behind the equipment), also around 4 dead roaches inside reach in cooler located in the kitchen. **Repeat Violation**." "Interior of microwave soiled with encrusted food debris,"
"Operating with an expired Division of Hotels and Restaurants license." "Interior of reach-in cooler soiled with accumulation of food residue. The one located inside the kitchen area." 6370 W. Oakland Park Blvd. "Roach activity present as evidenced by live roaches found. Observed 1 live roach by the hand washing sink in the kitchen, 10 live roaches by the 3 doors stainless steel reach in cooler, 20 live roaches by the Vulcan reach in cooler in the kitchen area, 1 live roach by the blender on the prep table in the kitchen area, approximately 50 live roaches at dry storage area." "Dead roaches on premises. Observed 5 dead roaches at dining room." "Hole in or other damage to wall behind the 3 doors stainless steel reach in cooler, cove molding is missing in kitchen area, floor with holes close to the reach in cooler, ceiling vents are dusty in kitchen, ceiling tiles in kitchen not easily cleanable." "Rodent activity present as evidenced by approximately 10 fresh rodent droppings found behind blue bunny cooler at front counter service station. Observed 4 flying insect in kitchen area." "Server handled soiled dishes or utensils and then picked up plated food, served food, or prepared a beverage without washing hands. Cook washed hands with cold water. Hot water takes too long to reach hand wash sink resulting in employees using only cold water to wash their hands. Sink in cook line. Cook rubbed hands together for less than 10-15 seconds while washing hands." "Potentially hazardous (time/temperature control for safety) food cold held at greater than 41 degrees Fahrenheit. Butter found on cook line prep table at 80°F, as per operator, item had been place on prep table 3 hours before inspection. Operator place item on ice to expedite temperature." "Rusted can of globe apple topping present. See stop sale." "Nonexempt fish offered raw or undercooked has not undergone proper parasite destruction. Fish must be fully cooked or discarded. Harbor banks brand." "Interior of oven has heavy accumulation of black substance/grease/food debris. Imperial double decker oven on cook line. Encrusted material on can opener blade." "Rodent activity present as evidenced by rodent droppings found. Observed approximately 30-40 dry rodent droppings on a large white dough machine. Observed 10 dry rodent droppings on the floor by the large oven in the rear of the establishment. 5 dry rodent droppings on the floor behind a upright unused oven near the kitchen. Observed 6 dry rodent droppings on another dough machine in another prep area. Observed 16 dry rodent droppings on the floor under a shelf use to store food and take out containers in the kitchen. **Repeat Violation*." "Exterior door has a gap at the threshold that opens to the outside. Rear door **Repeat Violation*."